Blogmate Karma put up her April Photo Scavenger Hunt list which I copied to my trusty iPhone Notes app. There is still time to join in as the deadline is this Sunday, April 24, 2011. This list was shorter but a bit harder to complete because of the cooler than normal weather which kept me either inside or the Spring growth under the ground and made trains very scarce. 1. Body of Water. This one was easy. 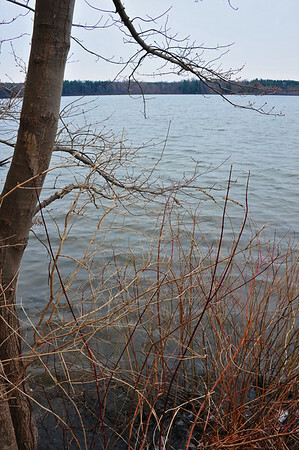 Below is Mud Lake located at the Beaver Lake Nature Center and the location of my 5K walk a week and a half ago. 2. Train. This is as close as I got to a train. I hope the bonus shot covers this one. 3. Hood. There are all kinds of hoods I could have photographed. 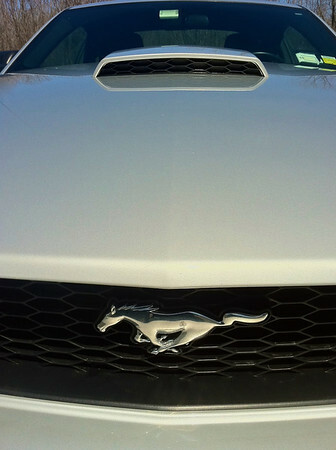 The one I enjoy sitting behind is the classic hood of my Ford Mustang. 4. Sprout. I first thought of the Jolly Green Giant’s sidekick for this one. Yet, I knew Karma was going after new growth. Not sure if this qualifies. Found it on a walk through the woods. Anyone know what this is? 5. Bud. Staying away from the obvious Budweiser wiseshot, I went with a sign of Spring from the Beaver Lake Nature Center hike. 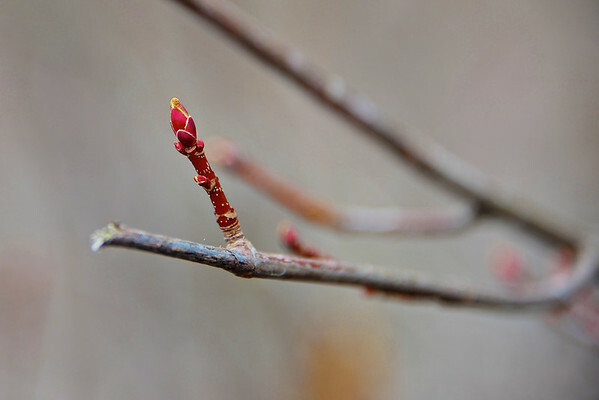 A sugar maple (Acer saccharum) bud in early Spring. 6. Basket. 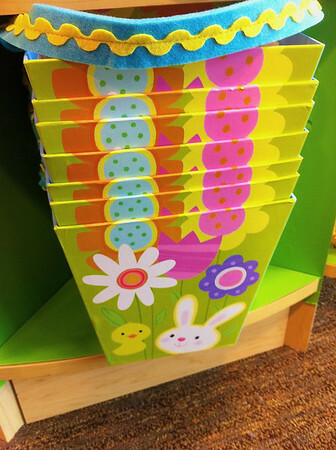 Easter is coming up so here is what some lucky kids will be finding this weekend filled with goodies. 7. Bunny. In this case, bunnies. Golden ones filled with Lindt chocolate. Anyone want one? BONUS! Really, I do not see why everyone has so much trouble photographing these birds. At the Beaver Lake Nature Center, they cater to them. Again, I was sweating it out at the end. Had to rely on walking the mall for the Easter photos and never did see a train. Looking forward to warmer weather for the next one, Karma! 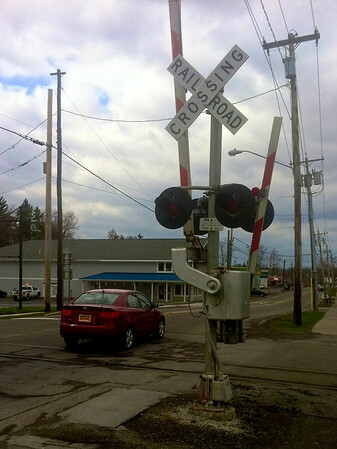 This entry was posted in Nature and tagged baldwinsville, beaver lake nature center, bud, cardinal, chocolate bunny, easter basket, feeder, ford, hood, mud lake, mustang, new york, railroad crossing, spring, sprout, sugar maple, tree, water. Bookmark the permalink. What? You didn’t want to wait around all day for a train?? Congrats on getting the bonus! Those little guys are MUCH harder to find around here. No, a train goes through town on some sort of strange schedule. Usually hear it really late at night. I wonder if the milk chocolate is the red or brown ribbon? Thanks, there was a few of them pigging out at the feeder. But wait, wait – are you not taking a class in night photography? Was it not your bounden duty to camp out by the tracks and get us a really atmospheric shot of the headlight coming out of the fog? 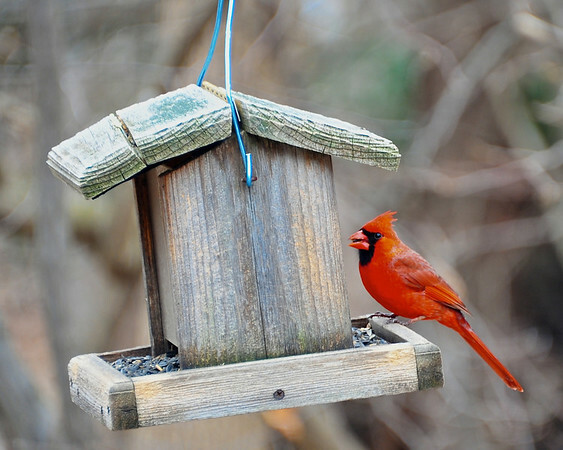 I love the bud photo and the cardinal – nice pops of color against the gray. 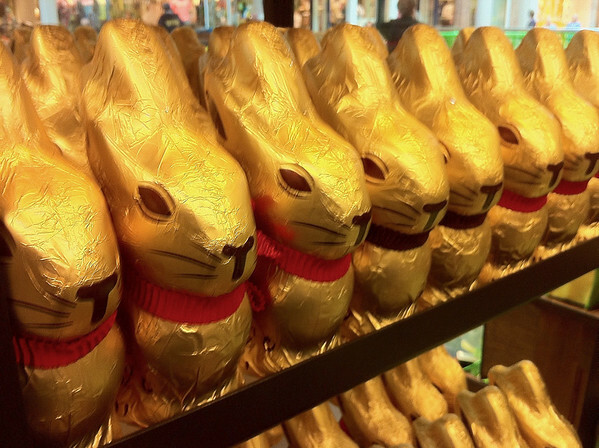 Sure, looks like there is plenty of bunnies to go around. That’s the good thing about a cloudy sky, colors really pop! Congrats on getting done early! I’m still missing a couple shots for my own hunt! I know what I want to do for them but haven’t had the chance yet. I do wish Mother Nature had cooperated a little more with some more sunny days. Your sprout looks like a weed I pull out of my garden, but I have no idea what it is called. Love your perspective on the hood and your Mr. Cardinal is great – nice sharply focused eye. That’s not easy to do on a bird in my opinion. (and of course I give you a pass on the train) Thanks for participating and hopefully June will bring us nicer shooting weather. LOL It probably is a weed. I know animals and birds. I know very few plant species. Thanks for the train pass! I sure hope it warms up for my May assignment, too. I like the maple bud very much–not just the lovely color, but the graceful curve of the composition. And the bunnies . . . oh my. I did the car too. Darn. I knew I shoulda used the shot of the Central Lake Trojans hooded sweatshirts in the Bachmanns window. At least I didn’t do the Bud wiseshot. I sure thought about it–would never have heard the end of it if I’d given in to the impulse, eh? Thank you, Gerry. I like the composition of the maple bud photo, too. I really am kicking myself on the Bud photo. I live near a Budweiser plant with a huge lighted sign that looks awesome at night. Oh, well, I may photograph it anyway. Oh I love Cardinals. What a beautiful shot. Beautiful shots Scott, I’m just missing a few. I have to keep a look out for the red cardinal in my garden. Thank you, Nye. Good luck with the cardinal…oh, I just looked. You got a good one. I am so jealous of your cardinal. I just can’t seem to get a clear capture of one. Well done! Beautiful shots. And yes please. I’ll have one of those bunnies. Yum! It helps when there is a feeder they like to eat at. He would come in for a few minutes so I had lots of opportunity. Sure, I’ll get you a bunny. I get they are on sale today, too. Scott, could that green sprouting plant be skunk cabbage? I believe you and Dawn are correct. 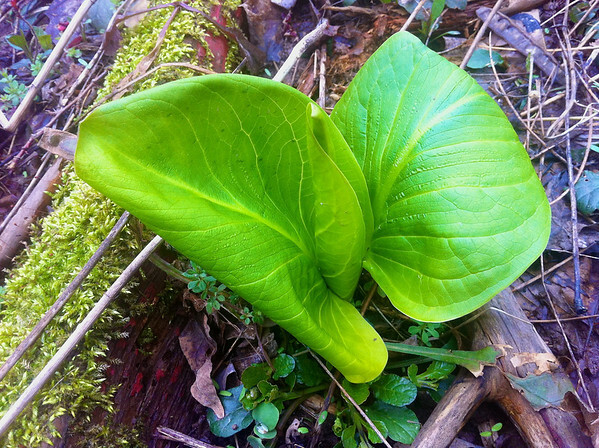 It is skunk cabbage. I will try and remember to go back and see if it has flowered. Yep, same bunny and same price. I left the bunnies where I photographed them. Didn’t realize you were a Mustang guy, Scott! We sold our 68 hardtop (http://milkayphoto.wordpress.com/2009/11/05/you-gotta-fast-car/) last summer…had her for over 20 years. One day we hope to own FIL’s 67 convertible…love that car! Sweet ride. Bet it was hard to give up. I have been driving Mustangs for most of adult life with a few breaks here and there. 4 Bangers, GTs and now this 2005 V6 which I got a couple of years ago with only 12K miles on it. The former owner didn’t drive it much as he did not like the 5-speed manual. I love it! Fun to drive and much better than the Fox body cars. Nicely done Scott… and a real sweet shot of the cardinal..